This online shop is intended only for private consumers. The Michelin X is the period correct radial fitment for MGB, Alfa Romeo and lots of french Classics. Tyres without labelling can only be used on cars built before October 1st 1990. Münchner Oldtimer Reifen GmbH was founded in 1984 by Valentin Schaal Jr. As a lover of classic cars, he realised how difficult it could be at that time to get the right tyres. Starting out in his parents' tyre shop in Otterfing, Bavaria, he devoted himself entirely to procuring tyre sizes that were difficult or impossible to find. His travels, especially across America, put Valentin in contact with those few manufacturers that still made classic tyre sizes. This was the beginning of his tyre import business. The market for tyres for vintage cars developed rapidly, such that European manufacturers such as Michelin, Dunlop and Avon returned to their roots and once again began making some of their classic tyre models. Many models were brought back at Valentin Schaal's suggestion. Soon his tyre store had outgrown its original space and the shop moved to its current location in nearby Holzkirchen in 1999. 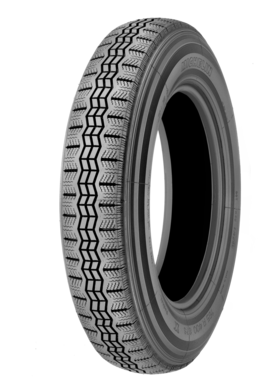 It's now possible for us to have almost every special tyre our customers need in stock and ready for quick delivery. Whether it's bias tires for the legendary VW Beetle or Opel Kapitän, American wide whitewalls for your Cadillac or Hot Rod, white-letter tyres for the muscle cars of the 60s and 70s, racing tires for pre-war cars or beaded-edge tyres for the very early vintage models, we can supply most within 2 days. We are especially proud of our patented vulkanisation process for whitewalls on tyres previously only available in black. Give your your classic of tomorrow that extra bit of class with some retro styling. We can also offer you comprehensive service for spoked wheels. In our own wheel repair shop, we can centre, repaint or even replace the spokes on your wheels. Switching to single nut wheels? We can order new spoked wheels from MWS and Borrani with all the necessary accessories such as the central lug nut adapter, knock-off center caps and mounting hardware. We also manufacture wheels for your pre-war car with drop centre rims, snap ring rims or also beaded-edge rims. Our professional consulting team is looking forward to hearing from you!